Where The Sidewalk Ends by Shel SilversteinChildren's Book. Skip to main content × Donor challenge: Your generous donation will be matched 2-to-1 right now. Your $5 becomes $15! Dear Internet Archive Supporter, I ask only once a year: please help the Internet Archive today. Most can’t afford to give, but we hope you can. The average donation is $45. If everyone chips in $5, we can end this... Pass out copies of Shel Silverstein’s “Band-Aids” poem from Where the Sidewalk Ends. Then split kids up into teams of two. Have one kid trace the other on an oversize sheet of butcher paper. Give each team 35 Band-Aids of various shapes or colors. 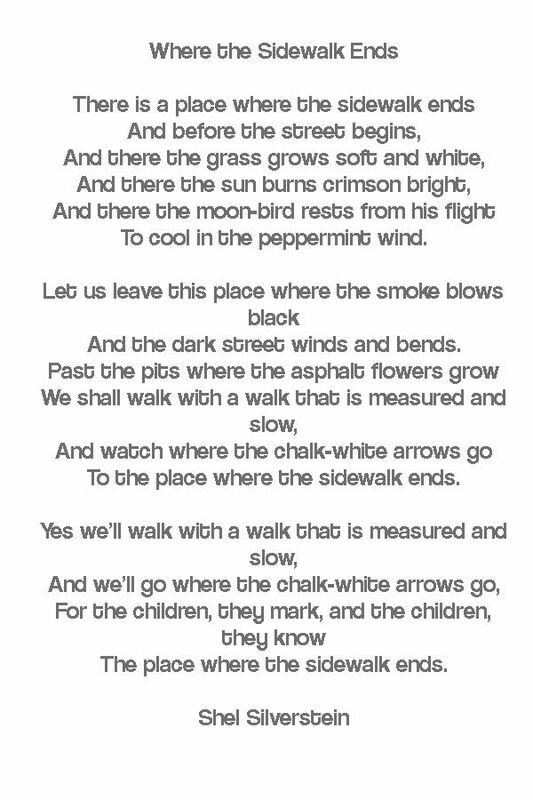 Full text of "Where The Sidewalk Ends By Shel Silverstein" See other formats Alice Ochs Vi’,*' jhel Silverstein is the author of THE GIVING TREE, and many other books of prose and poetry. Shel Silverstein, the New York Times bestselling author of The Giving Tree, A Light in the Attic, Falling Up, and Every Thing On It, has created a poetry collection that is outrageously funny and deeply profound. 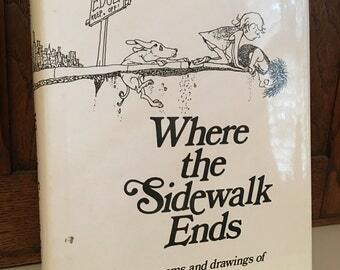 Come in…for where the sidewalk ends, Shel Silverstein’s world begins. This special edition contains 12 extra poems.